Disclosure: I received two henley sets for review from Snug Organics. All opinions are my own. I can't believe that the weather is summer-like, reaching the 80's-90's in the daytime. Sometimes it's stifling in the house even though we have the air conditioner running at night. Snug Organics has created a fantastic henley Pajama set ($28) in 100% organic cotton to keep kiddos cozy yet cool while sleeping. The natural color is really nice. Although I do love color, sometimes a basic can be oh so chic and clean. The coconut buttons add a bit of flair. I love the high neckline because that means the kids can't tug and stretch it out so that half their chest is showing - yes that has happened before. The elastic waistband makes it easy for Kenzie to put her own pajamas on and allows for quicker diaper changes for Mason. 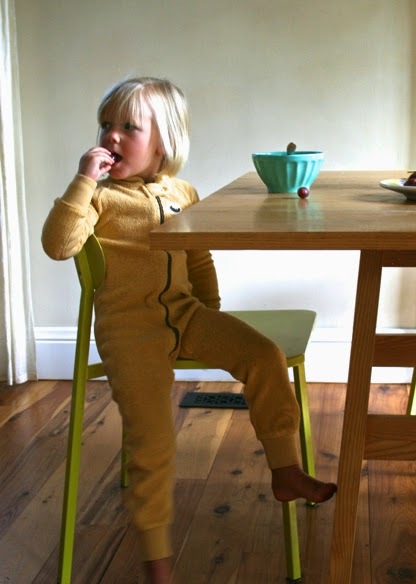 Both kiddos love their Snug Organics pajamas and they are cool and comfortable at night. These are even cute to wear during play and I would even take them outside in it because they are that adorable. Snug Organics also offers Organic Sherpa Sleepers that look soft and fuzzy to the touch. These would be perfect for those who are still experiencing beyond chilly weather! Make sure to connect with Snug Organics on Facebook and Twitter! One winner will Receive Choice of Sherpa Sleeper or Henley Set! Id chose the Sherpa Sleeper in Strawberry for my daughter. Im so jealous of your summer temps!!! I would choose the Summer Henley Set for my granddaughter. I would choose the Summer Henley Set for my middle daughter. The summer Henley set in pink for my daughter! Id pick the henley set in yellow or pink for my granddaughter. I'd pick the green summer Henley set for my son. Sherpa Sleeper for my older daughter, because it's so hard to find one-piece pajamas in larger sizes! I'd get the Henley set in the Periwinkle or Pink for dd! I LOVE the Wool Silk Nightgown! I would love the merino wool overalls in green for my baby girl! we love woolies! I love the Merino Wool Overall for my little guy! I'd choose the Sherpa in strawberry for my friend's daughter. I would get the henley set in periwinkle for my daughter. I would choose the sherpa sleeper in caterpillar for my nephew! I would choose the henley set in green for my friend's little boy. I would choose the Summer Henley Set in green for my nephew. I like Summer Henley Set in lavender for my little sister. I would choose the Henley set for my granddaughter. ORGANIC COTTON SHERPA SLEEPER in caterpillar, for my son. The Sherpa sleeper for my little girl.